Open doors and windows to secure an exit for escape and turn off gas valves and electricity. 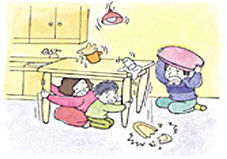 While shaking, which is usually over within one or two minutes, stay under a large table until the quake has stopped. If there’s nowhere to hide yourself, protect your head with pillows or blankets. If a fire starts, put it out quickly and calmly. There will be three times to control the fire during the earthquake stages: before the major shaking begins; right after the shaking has stopped and lastly, when the fire has just begun. Be careful of broken window glass or signboards that may fall down and hit you when going outside. 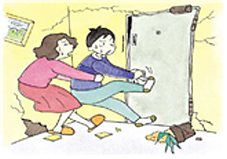 Do not use the elevator when an earthquake or a fire breaks out. If you are in the elevator, quickly exit and find safety. If you’re trapped in the elevator, use the emergency button or a cell phone to call for help. When the shaking stops, evacuate to a wide, open space. Also stay away from concrete walls, vending machines and other objects which could fall over.